In their recent newsletter, the Friends of Gunnersbury announced the receipt of a letter from Michelle Morley of John Laing Integrated Services [the contractor which now runs the Park and Museum] with outcome of a tree survey. The letter was accompanied by a series of plans and a complete schedule of all the trees which need specialist work reporting that the trees in Gunnersbury Park were recently inspected by Continental Landscapes working on behalf of JLIS. The team of arboriculturalists inspected 2,492 trees and 74 groups of trees in the park. The survey identified 58 requiring removal as a matter of urgency as they were found to have significant levels of rot and decay, creating a hazard to users of the Park. This represents 2% of the trees in the Park. In addition, the letter said that a further 213 trees required remedial works, representing another 8% of Gunnersbury’s trees. 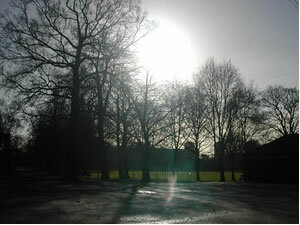 A map that gives the location of these trees on the Friends of Gunnersbury Park and Museum web-site, together with the schedule giving priorities for works. These show that there are trees with problems in every part of the Park and this is an ambitious programme that is being undertaken. Hounslow Council officers agreed that there was no option but to fell some trees as quickly as possible to reduce the risk of potential accidents, as well as pruning others. The necessary planning forms were submitted because the Park is in a Conservation Area. Notices were placed upon the trees to be felled and also around the park. Work has been in progress for several weeks and the whole programme is likely to take a period of six to eight weeks to complete.